Project OWL, an IoT and software solution that keeps first responders and victims connected in a natural disaster, has won the 2018 Call for Code Global Challenge. A panel of eminent judges that included former President Bill Clinton awarded the five-person, U.S.-based team the Call for Code Global Prize at a gala event Monday at San Francisco’s Regency Ballroom. 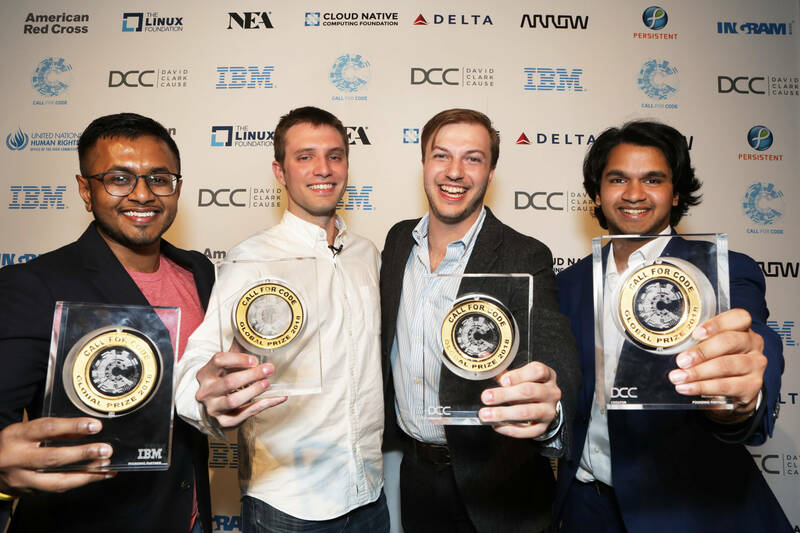 The team takes home the USD$200,000 grand prize and the opportunity to deploy the solution through the IBM Corporate Service Corps, among other benefits. Knouse knew he wanted to develop solutions to help people cope after natural disasters, but he had trouble finding venture capitalists willing to invest in these projects. When he learned about Call for Code, he jumped at the opportunity to get involved and join the affiliated Slack community. There, he met a group of like-minded individuals — Magus Pereira, Nicholas Feuer, Charlie Evans, and Taraqur Rahman — and Project OWL was born. The team addresses a fundamental question that arises in the wake of a natural disaster: How do you maintain critical operations and communications when the power is cut and cell connectivity fails? Project OWL, which stands for Organization, Whereabouts, and Logistics, is a two-part hardware/software solution. It provides an offline communication infrastructure that gives first responders a simple interface for managing all aspects of a disaster. The physical “clusterduck” network is made of hubs resembling rubber ducks, which can float in flooded areas if needed. Only five are needed to cover a square mile, and they create a mesh network that can send speech-based communications using conversational systems (like Alexa and Facebook Messenger) to a central application. This application, the OWL software incident management system, uses predictive analytics and multiple data sources to build a dashboard for first responders. “Once this network of ducks is deployed and then clustered, civilians are able to basically get on the devices through a really intuitive interface and contact first responders with a list of things that are really essential to them,” Pereira said. With this information, Project OWL allows first responders to manage a disaster, coordinate resources, learn about weather patterns and get information data analytics through the cloud. The solution bakes in the latest IBM Watson Studio, Watson Cloud APIs, and Weather Company APIs — all built on the IBM Cloud. Weather data forms a core part of the application, with the ability to ask questions like “Which direction is the nearest tropical storm is headed?” and “What conditions can you expect tomorrow night?” after hurricane flooding. The team is working on testing OWL in simulated environments with response teams. They plan to roll out to small incidents before deploying in full-scale disasters. Their goal is to focus on regions where annual weather patterns consistently impact communities negatively, such as India, China, the Philippines, and parts of the U.S. In addition to the cash prize and support from the IBM Corporate Service Corps, the team members, who hail from New York and North Carolina, will have the opportunity to pitch OWL to venture capitalist firm NEA for potential funding. Daryl Pereira, Kevin Allen and Liz Klipp contributed reporting to this article. With AI taught by 3D model images, displaced residents could get immediate access to engineering advice.